Las Vegas Metropolitan Police Department Undersheriff Kevin McMahill on Wednesday denied race played a role when officers detained Seattle Seahawks defensive lineman Michael Bennett last month after the Floyd Mayweather-Conor McGregor fight. Video played by the undersheriff at a press conference showed officers responding to reports of an active shooter inside a nightclub at the Cromwell Casino. At the end of the video, Bennett is detained by officers after he runs out of the building and jumps over a sound wall onto a busy street. Bennett attracted national media attention Wednesday when he posted a letter on his Twitter account that accused Las Vegas police of using excessive force and threatening to kill him. 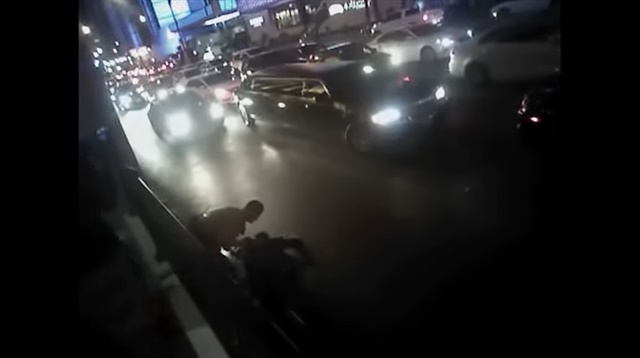 According to Bennett’s letter, he was headed back to his hotel after the fight, which took place Aug. 26 at T-Mobile Arena, when several hundred people heard what sounded like gunshots, the Review-Journal reports. “Las Vegas police officers singled me out and pointed their guns at me for doing nothing more than simply being a black man in the wrong place at the wrong time,” Bennett wrote on Twitter. McMahill says no shots were actually fired. That people in the nightclub called police about gunfire because of a yet unidentified noise in the club.